A love for Jesus and science: Claire Forbes married Caleb McNaught in Nambour last July. WHEN Brisbane’s Bethany Keady wed Dan Bottesini last December, in a spirited Nuptial Mass and wedding reception, their immense joy couldn’t have been bottled. Prompted to share of the pull towards a marriage vocation, the newly-crowned Mrs Bottesini was quick to relate the shared joy, evident in many young couples around them. 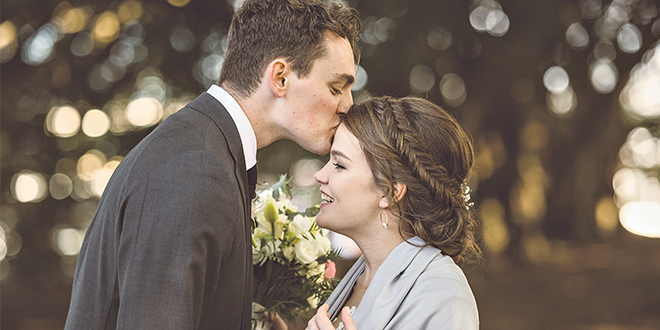 Their collective witness to the blessings of commitment allows a deeper understanding of how following God’s design for marriage is as relevant today, as it was decades ago. Bethany and Dan met at age 14 through mutual friends at a youth event. “I instantly thought he was cool and funny but didn’t see him romantically because he was actually dating her (the friend),” Bethany said. Eventually forging a firm friendship and partnering each other at their senior formals, the vibrant member of Ignite Youth, who’s now studying teaching and exercise science, was drawn to Dan’s “cheeky sense of humour”. Each ministering within the peer-to-peer youth outreach of National Evangelisation Teams (NET) “in different parts of the country”, the duo realised God was nurturing “something special”. “We’ve learnt so much together and have both grown since we started our romantic relationship,” Bethany said. “I knew Dan was ‘the one’ when I realised that I would never, ever want to be with anyone else and could not even imagine ever being with someone else. It was on Bethany’s 20th birthday that Dan proposed. Married life since their union in Our Lady of Victories Church, Bowen Hills, celebrated by Oblate Father Michael Twigg, rector of Dan’s former college of Iona, Lindum, has unravelled beyond expectations. “Life with Dan is never boring,” she said of her barista husband. “We’re learning each other’s habits and traits, and how to manage a house and life together. Claire Forbes and Caleb McNaught were also privy to the NET experience, and joked they became friends over a “common love of science, carbohydrates and Jesus”. “Caleb had a crush (on me) from the very beginning but it wasn’t until two-and-a-half-years later that I cottoned on to the idea that this man was amazing in every way,” Claire, a mid-wifery student, said. Within tertiary circles, Caleb studying engineering, the couple “reconnected” at a campus Mass, first dating in 2016. 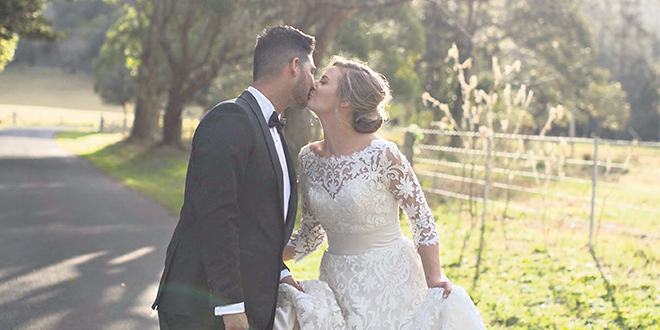 Their July 2018 wedding in Caleb’s home parish of St Joseph’s, Nambour, was “nothing overly fancy” with a focus on “family, faith and friends”. His uncle, a priest from Iowa, was the celebrant in an “incredible day”, the duo agreed. Claire, now 25, had felt a call to both religious life and marriage. “When Caleb asked me out, I made it clear that I was still discerning,” the former microbiology student said. “When we’d been dating (for) five months, I left for two weeks to formally discern with the Maryknoll sisters in East Timor. “We didn’t speak while I was away … (and) we knew that when I returned, unless I was certain God was calling me to marriage, we would break up. “It was an emotional time but a beautiful one. “I learnt that I need to find my home in God through another person … (and) I felt that my call to mission was through family. Today, Caleb designs fibre optic networks while Claire works in disability support services and continues studying. “I focused on the career side of things,” he said. “I thoroughly enjoyed my uni courses and, through my time on NET, realised that I was called to the challenges of companionship. “This, coupled with the unique loneliness I felt when I imagined religious life, made me realise that I was seeking a life partner in my vocation. Claire said marriage, for her, “is home” because every day she “loves God through Caleb”. Her husband was equally affirming, describing marriage as “the most emotionally satisfying experience” of his life. “I have someone to journey with in the mundane and the exciting,” Caleb said. An Irish Ball was the backdrop for some of the early chemistry between Niamh Healy and Peter McAuliffe, who also first met on NET in 2014. They both recounted stories of “telling a friend or family member that the other was going to be a future spouse”. As God stirred their hearts, the couple realised the importance of “remaining open to all vocations”. “This time (of discernment), for us, was very necessary and as we look back, we’re grateful that we had it,” Niamh, whose familial roots are in County Mayo, in the west of Ireland, said. That commitment was celebrated in July 2018 in St Patrick’s Church, Islandeady, Ireland. Today, the duo agreed that “prayer and surrender” was at the heart of the call, discernment and commitment to a marriage vocation, with God “inviting” them on the “journey with Him”. “We both had to make a choice to dive into the unknown and simply trust that God would be with us,” Niamh said. It’s been a time of “love, forgiveness, discovery and laughter” with baby McAuliffe expected in June. “We’ve been growing in our friendship and love for one another every day, through, and in, the challenges of our humanity and in the everyday choice to love,” Niamh said. Married just after Niamh and Peter, Pia Irwin and Arnaud (Arnie) Hurdoyal also built a strong friendship base “for a few years” before contemplating dating. More wedding bliss: August 2018 held a special date for Pia Irwin and Arnaud (Arnie) Hurdoyal. Pia said she’d been “in and out of unhealthy relationships” and it was when she “took a break from dating” that the couple crossed paths. “Apparently he had a crush on me from day dot but for me, the feelings took their time and then hit me all at once,” she said. “I knew Arnie wasn’t perfect and I knew I wasn’t perfect either. “We figured out during our dating relationship, and still even today, that we were pretty different people. “(But) there was this sense of deep peace and being at home with Arnie. The duo was married in the rural and coastal town of Nowra, New South Wales, and Arnaud was said to “ball his eyes out” as Pia approached the altar, her “highlight” the vows. “I knew how important the vows were and I said every word with meaning and a choked up voice,” she said. “Getting married definitely felt like stepping out into the deep, and I felt it was very much a call into the unknown, and into a new but beautiful life. “So far, by stepping out into my vocation to Arnie, I’ve grown, been stretched in ways I thought I couldn’t, learnt new humility and that I’m capable of more than I thought. “(We have) gone deeper into this mystery that is the heart of God. They excitedly announced another impending birth, a boy in June. “We know we have a God who loves, cares and provides for us,” Pia said. Ignite Youth’s Summer Camp initiative brought together more than dozens of teenagers. It also was where Sarah Norris and Nick Kelly met, as leaders. They began a long distance relationship, including six months of overseas study for Sarah while God revealed His plans early to Nick, a youth worker. “From one of the very first times we were hanging out together, I got an incredible sense from God that Sarah was incredibly special,” he said. A “particular moment” of Sarah’s vocational discernment in 2017 came to mind. “During Immaculata Mission School, one of the sisters had shared her testimony of her journey into religious life,” Sarah said. “Her story was quite similar to mine. She was studying social work and in a serious long-term relationship. “I sat in adoration, bewildered that God had presented this to me on the last day of the retreat … (and) when I asked, what is my vocation, all I felt was peace. Nick’s “continued discernment” presented the same outcome, he said, and God had another moment of clarity to offer. “A week before we got engaged, I had a beautiful prayer time in adoration with the monstrance shining like the shape of the engagement ring I had seen before,” Sarah said. Sarah and Nick, both 24, exchanged marriage vows in St Benedict’s Church, East Brisbane, in August last year. The new Mrs Kelly described the marriage journey so far as “wonderful” and “a huge learning curve”. “On one hand, it’s been so good being able to build a life and home together,” she said. “On the other side of things, it really has been that personalised journey of holiness. “All my faults had a way of rising to the surface. Nick, who’s studying theology, said marriage has been “anointed” with “a tangible grace from God” of His presence. “I couldn’t have expected how much I’ve learnt, about Sarah and about myself,” he said. Each newly married duo offered advice for individuals and couples discerning their vocation. Bethany said not to “get caught up in finding ‘the one’”. “I use to overthink it so much, asking, ‘Is Dan really ‘the one’? Claire said she felt as though her vocation “walked right into” her heart and “made itself a home”. “If we discern the little things each day and grow more attentive to the voice of God, we’re better able to listen when He starts whispering about the bigger choices,” she said. Caleb reiterated a “don’t stress too much” reality, adding, “Spend your time answering the questions you can and just let God do His thing”. Niamh and Peter were on the same page about “praying and not panicking” about choosing a vocation, agreeing “it will eventually become clear”. Pia’s reflections quoted a leading expert on vocational discernment. “I’ve heard Archbishop (of Brisbane) Mark Coleridge say, on a couple of occasions, ‘God often surprises, but he never disappoints’,” she said. “Be open but don’t become a perpetual discerner, at some point you must step out into the deep.